Trump Budget Slashes Funding For Many Global Health And Development Programs But A Few Are Spared : Goats and Soda The fiscal plan "puts America first" by slashing funds from many (but not all) global health and development programs. 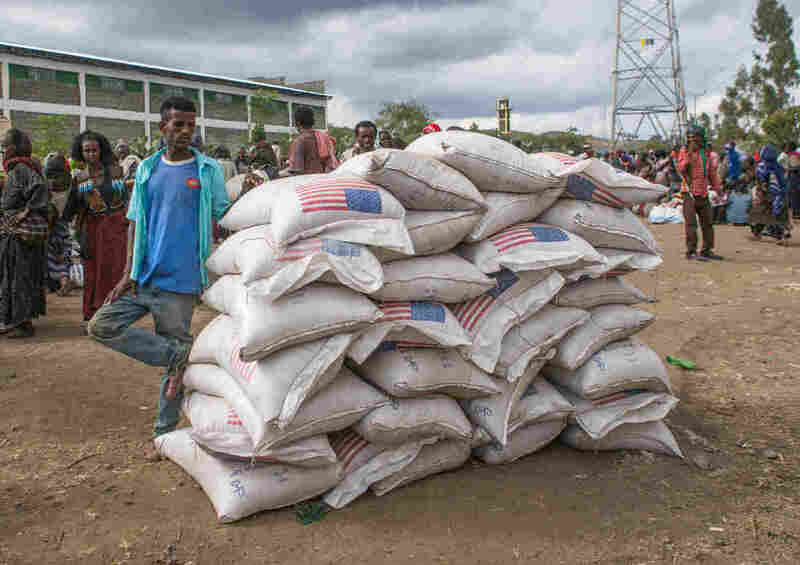 A food distribution center in Ethiopia. Under Trump's plan, there would be far fewer dollars for aid efforts abroad. In the introduction to his proposed federal budget, President Donald Trump states clearly that he plans to spend far less abroad and on international issues than did previous administrations. One of the five bullet points in the introduction to the document "America First: A Budget Blueprint to Make America Great Again" states that the fiscal plan "puts America first by keeping more of America's hard-earned tax dollars here at home." To accomplish that goal, the administration proposes slashing the appropriation for the State Department and USAID by $10 billion or roughly 28 percent and cutting Treasury International Programs by nearly a billion dollars, almost a 35 percent drop from last year. The budget proposal states that the cuts to foreign aid "free up funding for critical priorities here at home." Here's a rundown of agencies and programs in the global health and development sphere that would lose funding if the budget is passed by Congress — and the ones that won't be affected. United Nations and affiliates. The blueprint says the administration will reduce funding for the United Nations, U.N. agencies, U.N. peacekeeping operations and "other international organizations." It doesn't give a dollar figure or a target of what percentage funding would go down. Banks that finance global development. The World Bank and others would lose $650 million over the next 3 years. Climate change efforts in developing countries. The document explicitly says that funding will be eliminated for the Global Climate Change Initiative (GCCI). The Congressional Research Service sums up the GCCI this way. "The United States supports international financial assistance for global climate change initiatives in developing countries .... The GCCI aims to integrate climate change considerations into U.S. foreign assistance through a range of bilateral, multilateral and private sector mechanisms to promote sustainable and climate-resilient societies, foster low-carbon economic growth and reduce greenhouse gas emissions from deforestation and land degradation." In addition to slashing direct funding to federal programs related to climate in developing nations, the president's new budget also says it would stop payments to U.N. programs on climate change. Vaccine efforts. The President's budget explicitly mentions two international health programs that it does plan to continue to support. The first is Gavi, the Vaccine Alliance, a public-private partnership based in Geneva and Washington, D.C. that helps develop and fund immunization programs primarily for the developing world. Their goal is to make sure 300 million children in the poorest parts of the world get access to routine vaccinations. The second is PEPFAR, the incredibly successful anti-AIDS program that started under President George W. Bush. PEPFAR is credited with getting anti-AIDS drugs and other HIV related assistance to millions of people, particularly in Africa. Through PEPFAR the U.S. channels nearly $7 billion a year in to HIV/AIDS programs around the globe. While the proposal calls for major cuts to the State Department's base funding, it gives the agency $2.2 billion for new embassy construction and security upgrades, $3.1 billion for security assistance for Israel and $12 billion in Overseas Contingency Operations (OCO) funding. The OCO is a joint program between the State Department and the Defense Department that covers training foreign security forces and counter-terrorism operations among other war-related activities.